Each flight of stairs has its own story to tell. 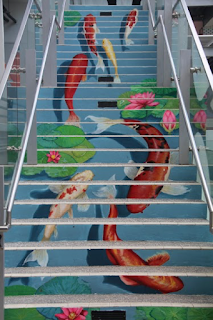 Around Hong Kong, it’s not that uncommon to find illustrations on staircases. 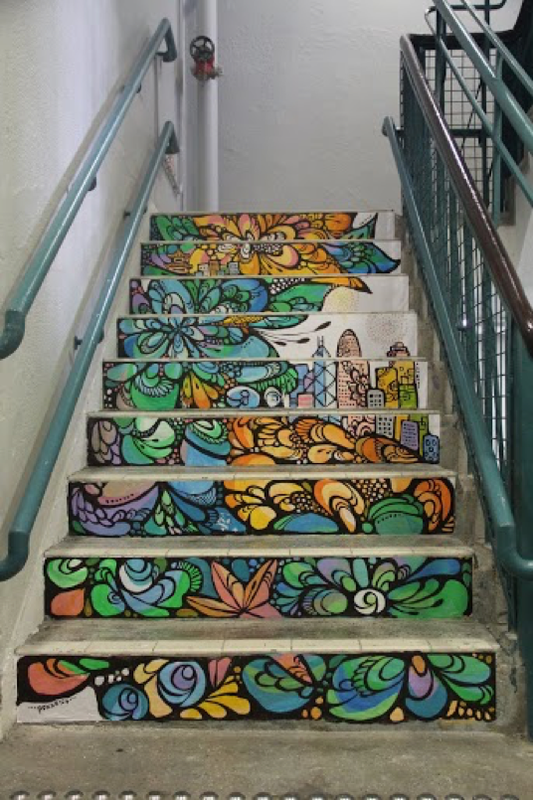 But recently, I’ve noticed something quite out of the ordinary – 25 staircases all painted and grouped together in the same location! 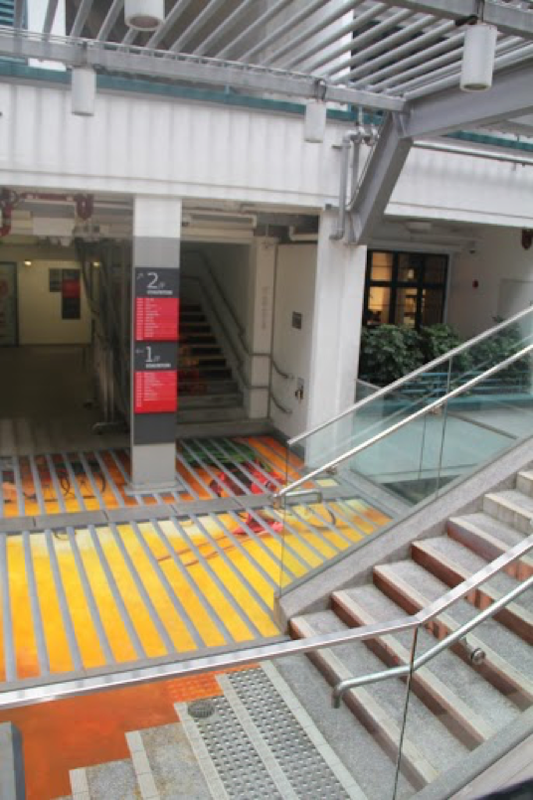 This place is none other than PMQ, the new creative hub that’s taking creativity and design in Hong Kong to the next level – one “step” at a time. 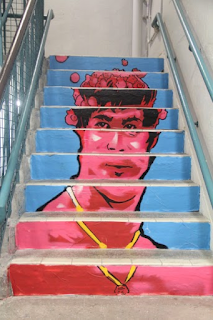 This unique art project, named “Hong Kong on Steps”, brought together local and overseas artists to create stair paintings inspired by the vibrant and diverse Hong Kong landscape. The seven groups of artists hailed from Taiwan, Japan, South Korea, France and Hong Kong, an interesting combination that has beautifully transformed the way we see PMQ as we walk up. I first noticed something out of the ordinary back at PMQ in Mid-October, as I was walking around the restaurant facing Hollywood Road. 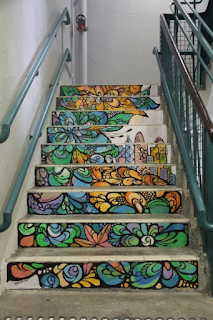 I was planning to take the staircase up to the second floor, to find a group of people with paintbrushes in their hands heartily painting with elaborate stokes on the staircase. Upon closer scrutiny, I realised they were painting goldfishes and lotuses in a lush blue pond. The fact that they were from South Korea gave the scene a decidedly more oriental touch. At the head of this team was Professor Lee Tae Ho, a multimedia artist who also taught at the College of Fine Arts in Kyunghee University in South Korea. He had a friendly and slightly comical demeanour, which showed when he noticed me watching his team at work. I learnt that for each of his paintings, he had to take many, many pictures in order to create the perfect scene to imprint on the stairs. For this goldfish one, he had taken more than 300 pictures of goldfish, all to find the perfect beautiful posture to paint! I also encountered the Japanese artist Yukino Ikeshiro, also known as Pokke104, on the stairway of the first floor of the Hollywood Building. She was humming and smiling happily while she painted, complementing her vibrant and colourful painting perfectly – both seemed to cheer you up involuntarily when you gazed upon them. Her love for the “gajumaru”, the Okinawan Banyan tree, shows clearly in her paintings as its intricate lines weave throughout her landscape of Hong Kong. Another artist I met was Ceet Fouad from France as he was painting on the other end of the first floor of the Hollywood Building. He was quite distinctive with his gas mask covering his nose and mouth when he painted, reminding me of a character from a Marvel superhero movie. What was interesting about his style was his use of cartoon chickens in his paintings. His chickens found their way everywhere, even forming a wreath around Bruce Lee’s head! Ceet said they gave new life to his paintings, adding a touch of positivity and happiness to his audience as they caught eye of his mischievous chickens. 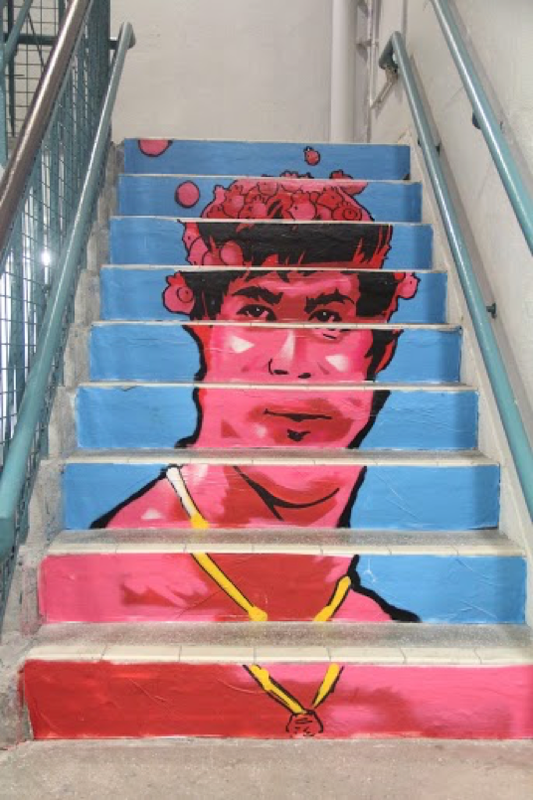 And there were a number of other artists that had left their mark around the stairs at PMQ, such as Bao Ho, OmniArt and Brainrental from Hong Kong, and Candy Bird from Taiwan. 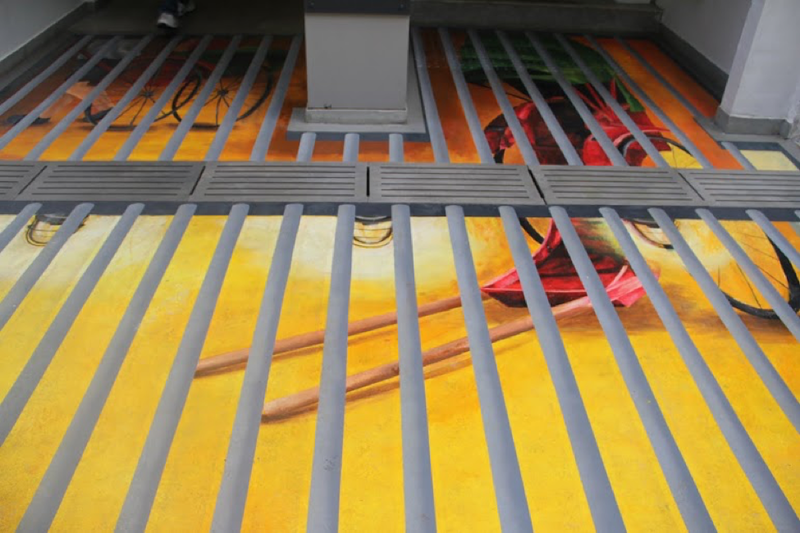 All these lively paintings by these seven groups of young artists has added a dynamic and lively touch to PMQ’s historic steps. “Hong Kong on Steps” has given PMQ a swirl of positive and creative energy, winding along each of its stairways.